NOTE: The collections noted as "ADDED 1 Jan 1970" are listed as "Legacy" on the website. 1) What day of the week was your Grandfather born (either one)? Tell us how you found out. 2) What has happened in recorded history on your Grandfather's birth date (day and month)? Tell us how you found out, and list five events. 3) What famous people have been born on your Grandfather's birth date? Tell us how you found out, and list five of them. 4) Put your responses in your own blog post, in a comment on this blog post, or in a status or comment on Facebook. 1) I picked my maternal grandfather, Lyle Lawrence Carringer, who was born on 2 November 1891 in San Diego, California. 2 November 1891 was a Monday. * In 1889, North and South Dakota were admitted to the Union as the 39th and 40th states. * In 1895, the prize for the first gasoline powered race in the U.S. was $2000. * In 1920, KDKA in Pittsburgh, starts broadcasting as the first commercial radio station. * In 1947, Howard Hughes made the first and only flight of the Spruce Goose, the largest fixed-wing aircraft ever built. * In 1983, President Ronald Reagan signed a bill creating Martin Luther King Jr. day. * In 1734, Daniel Boone was born (died 1820). * In 1755, Marie Antoinette, wife of King Louis XVI of France, was born (died 1793). * In 1795, James K. Polk, 11th President of the United States, was born (died 1849). 2288. Nicholas Snow, born about 1604 in England; died 15 November 1676 in Eastham, Barnstable, Massachusetts, United States. 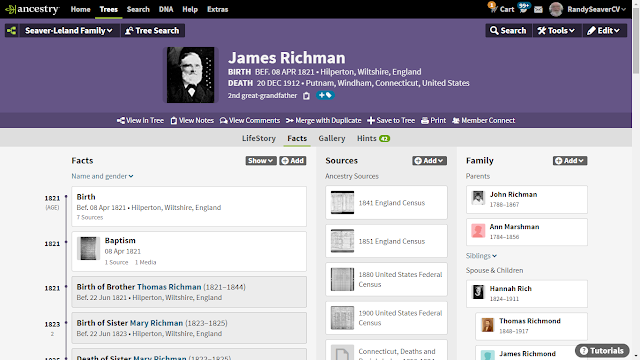 He married 22 May 1627 in Plymouth, Plymouth, Massachusetts, United States. 2289. Constance Hopkins, born before 11 May 1606 in Hursley, Hampshire, England; died 25 November 1677 in Eastham, Barnstable, Massachusetts, United States. * Mark Snow (1628-1695), married (1) 1655 Anne Cook (1636-1656); (2) 1660 Jane Prence (1637-1712). * Mary Snow (1630-1704), married 1650 Thomas Paine (1627-1706). * Sarah Snow (1632-1697), married 1655 William Walker (1620-1703). * Joseph Snow (1634-1723), married 1659 Mary LNU (1640-1729). * Stephen Snow (1636-1705), married 1663 Susanna Deane (1634-1701). * John Snow (1638-1692), married 1669 Mary Smalley (1647-1703). * Elizabeth Snow (1640-1678), married 1665 Thomas Rogers (1638-1678). * Jabez Snow (1642-1690), married 1670 Elizabeth Smith (1648-1733). * Ruth Snow (1644-1717), married 1666 John Cole (1644-1725). * Constance Snow (1646-1682), married 1667 Daniel Doane (1636-1712). 4578. Stephen Hopkins, born before 30 April 1581 in Upper Clatford, Hampshire, England; died before 7 July 1644. He was the son of 9156. John Hopkins and 9157. Elizabeth Williams. He married before 13 March 1603/4 in Hampshire, England. 4579. Mary Kent alias Back, born about 1580 in Hampshire, England; died before 09 May 1613 in Hursley, Hampshire, England. * Constance Hopkins (1606-1677), married 1627 Nicholas Snow (1600-1676). * Giles Hopkins (1608-1690), married 1639 Katherine Whelden (1617-1689). * Caleb Johnson, "The True Origin of Stephen Hopkins of the Mayflower," The American Genealogist, Volume 73, Number 3 (July 1998), Pages 161-171. * Ernest M. Christensen, "The Probable Parentage of Stephen Hopkins of the Mayflower," The American Genealogist, Volume 79, Number 4, (October 2004), Pages 241-249. * John D. Austin, Mayflower Families Through Five Generations, Volume Six: Stephen Hopkins (Plymouth, Mass. : General Society of Mayflower Descendants, 2001), Third Edition, Stephen Hopkins. * Robert Charles Anderson (editor), The Great Migration Begins, Volume II (Boston : NEHGS, 1995) pages 986-989, Stephen Hopkins sketch. I have done no original research for this Snow or Hopkins family. NOTE: Shirley Edmonds provided additional information on Stephen Hopkins and Nicholas Snow and I have edited this blog post. My thanks to Shirley. * The Photo Detective Podcast: Episode 37: What’s New With Vivid-Pix Restore? * DearMYRTLE YouTube: AmericaGen: Chapter 20 "Court Records and Family History"
* DearMYRTLE YouTube: WACKY Wednesday - You, too can ZOOM! * DNA Family Trees YouTube: Are you looking in the right place for your Family? * DNA Family Trees YouTube: HURRY! Limited Time Only! Ancestry UK records free access this Easter weekend! 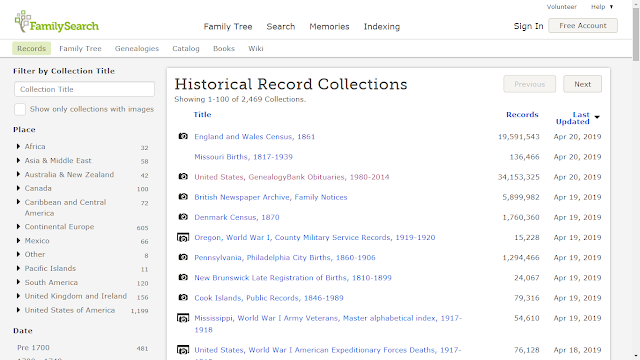 8) Did you miss the last Genealogy News Bytes - 16 April 2019? At the bottom of the icons on the left side of the screen is a "DNA" helix icon. The "ThruLines (TM) Icons" button is set to "Off." 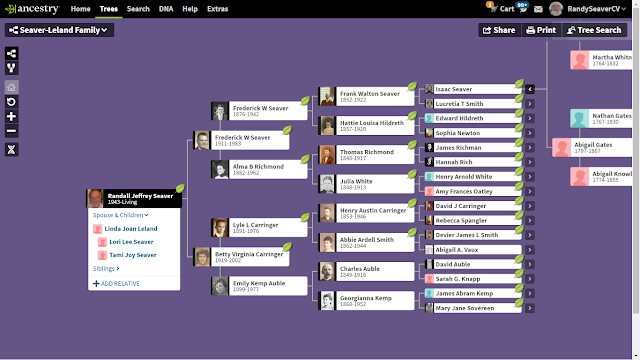 I moved it to "On" by clicking on the right side of the gray "Off" button" and set it to "On:"
Immediately, every person on my pedigree chart, back to 5th great-grandparents, sported a blue "ThruLines(TM) icon." 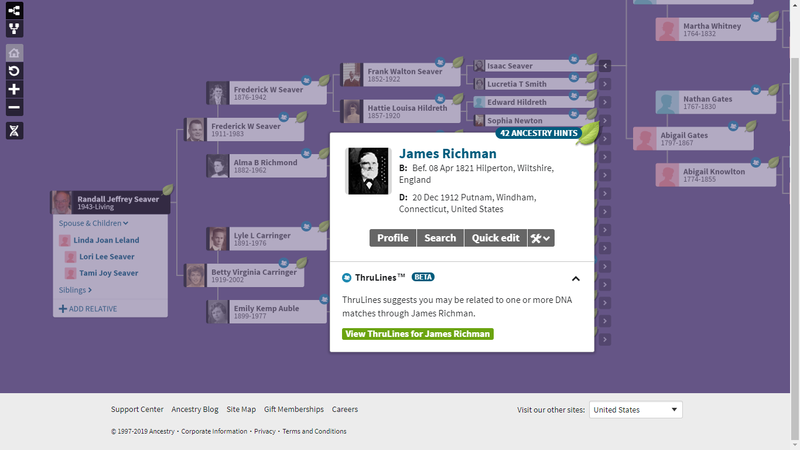 The card now has a section for "ThruLines(TM) - with a green button to "View ThruLines for James Richman." I think that this is a useful feature for Ancestry Member Trees. 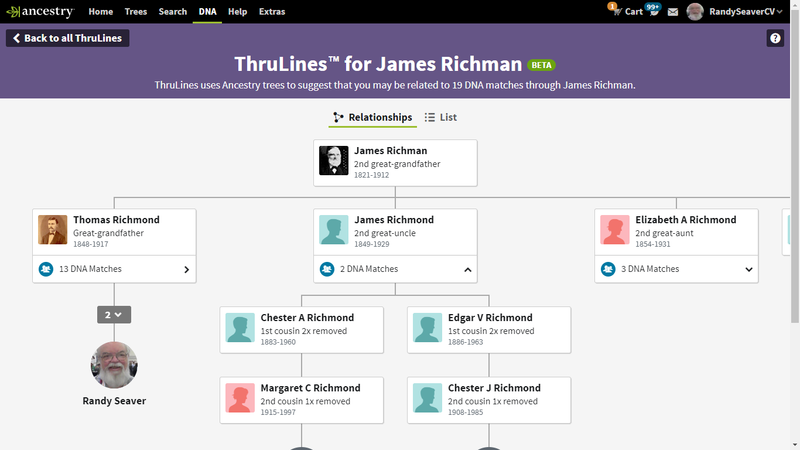 It's a short-cut - you don't have to wade through all of your ThruLines on the AncestryDNA ThruLines page to find the ancestor you want. * for ancestors for whom you, as the tree owner, are the only DNA match. UPDATED: The last line above was inaccurate - it was not meant to be exclusive. I added the third bullet, and changed the 4th bullet above. It does show the icon when there are other DNA match ThruLines from the common ancestor, but it also shows the icon when the tree owner is the only ThruLine. 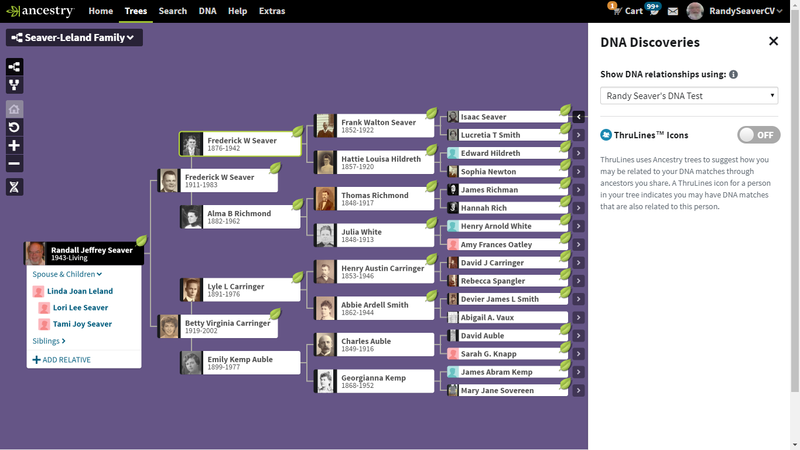 Maria (--?--) (Abel) Tedrick (1693-1771) is #449 on my Ahnentafel List, my 6th great-grandmother, who married #448 Andreas Abel (1690-1751) in about 1713 in Germany. 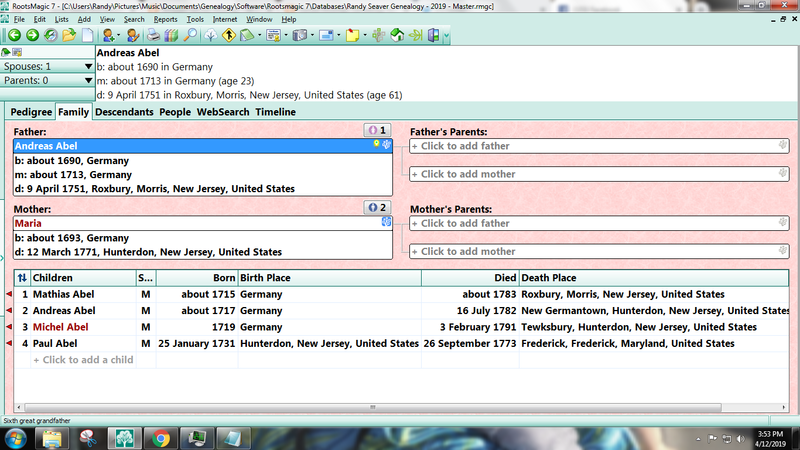 * their son, #224 Michel Abel (1719-1791), married #225 Christina --?-- (1730-1804) about 1755. * their son, #112 Johannes Abel (1758-1818), married #113 Sophia Trimmer (1755-1811) in 1777. * their son #56 John Auble (1780-1831), married #57 Anna Row (1797-1860) in 1804. 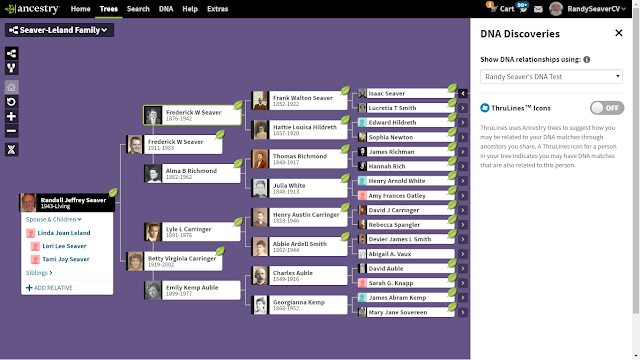 * their son #28 David Auble (1817-1894), married #29 Sarah Knapp (1818-1904) in 1844. * their son #14 Charles Auble (1849-1916), married #15 Georgianna Kemp (1868-1952) in 1898. * their daughter #7 Emily Kemp Auble (1899-1977), married #6 Lyle Lawrence Carringer (1891-1976) in 1918. * their daughter #3 Betty Virginia Carringer (1919-2002) who married #2 Frederick Walton Seaver (1911-1983) in 1942. The information on this family was obtained from the book Early Germans of New Jersey by Chambers, and the book The Able Aubles by Juanita Hayter Crampton. Maria --?-- was born in about 1693 in Germany, perhaps in Alsace-Lorraine. Her birth date, birthplace, and parents are not known, although some researchers claim she is Maria Maier born in about 1703. She married Andreas Abel (1690-1751) in about 1713 in Germany. The Andreas Abel family left the port of Portsmouth, England on 22 June 1728 bound for America on the ship Albany, master Lazarus Oxman from Rotterdam. This ship landed in Philadelphia on 4 September 1728. They settled in Fox Hill in what is now Morris County, New Jersey. * Mathias Abel (1715-1783), married about 1750 Margaret --?-- (1729-????). * Andreas Abel (1717-1782), married about 1740 Hanna --?-- (1720-1783). * Michel Abel (1719-1791), married about 1755 Christina --?-- (1730-1804). 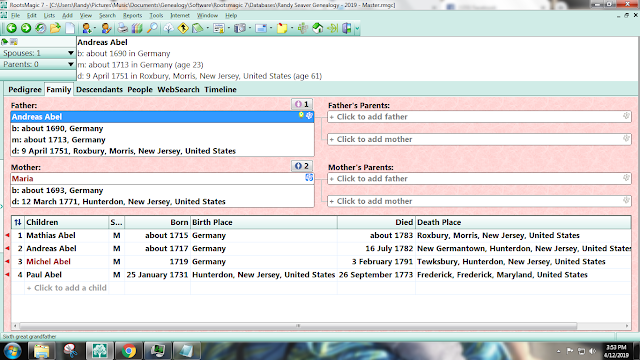 Andreas Abel died on 9 April 1751 in Roxbury, New Jersey(AA). He left a will written in German, dated 28 February 1750[2,5]. "My two sons, Michael and Paul shall maintain my wife, Mary (Maria). My son Paul shall have my small chest and the wagon and the new saddle and one bea hive and one pewter quart. And my wife shall live in my house, shall keep her own fowls and they shall find my wife victuals and drink and if they plant, maintain her well. Shall each of my two sons give her yearly ten bushels of wheat and one fat hog, and shall carry the wheat to the mill for her to be ground when she wants it. They shall bring the firewood to the house and they shall keep two cows and one horse, winter and summer, feed them and keep them. "I give to my wife, Mary (Maria), sixty acres of land by a line joining Court Casper downwards, for a help for her if she should want. My wife shall have two pewter basins and a small pewter basin and two pewter plets, two spoons and one cow. She shall have her choice out of the flock and one heifer, one mare and a mare called Afso. She shall have half the orchard or half the apples and two bea hives and her saddle and the great chest, the painted tankard, one iron pot, a copper kettle of one biggest and a little iron pot and she and Paul shall have light sheep and the big iron kettle together." "To eldest son, Matthias Auble, 20 shillings. To son, Paul Auble, 10 pounds. Sons Michael Auble and Andreas Auble, 60 acres of land where I live. To Samuel Drake's wife, my best cow and the bell she has on, with a strap, for attending me while sick, and I give Samuel four bushels of wheat and three of buckwheat for the favor he has done me. Son, Michael Auble's daughters, Caty and Eve, each a pewter basin. The rest of my estate I give to my grandchildren." This will finds Mary with the same 60 acres that was left to her by her husband, Andreas Able and also mentions their four sons(AA). Mary (--?--) (Abel) Tedrick died in March, 1771. She is probably buried on the Davenport Tract in Roxbury, New Jersey, the site of their farm and near the Union Reformed Church in Fox Hill. 1. Theodore Frelinghuysen Chambers, The Early Germans of New Jersey: their history, churches, and genealogies (Baltimore, Md. : Genealogical Publishing Company, 1982), page 227, Andreas Abel sketch. 3. Find A Grave, indexed database and digital image, (http://www.findagrave.com), Zion Lutheran Church Cemetery, Oldwick, N.J., Anna Maria Mayer Abel memorial #27040729. 4. A. Van Doren Honeyman, editor, Documents Relating to the Colonial History of the State of New Jersey:: First Series -- Volume XXXIV: Calendar of New Jersey Wills, Administrations, etc., Volume V -- 1771-1780 (Somerville, N.J.: The Unionist Gazette Association, Printers, 1928), page 517, Mary Tedrick will abstract; digital images, Ancestry.com (http://www.ancestry.com). 5. A. Van Doren Honeyman (editor), Documents Relating to the Colonial History of the State of New Jersey, First Series, Vol. XXXII; Calendar of New Jersey Wills, Administrations, etc. Volume IV, 1751-1760 (Somerville, N.J. : Unionist-Gazette Association, Printers, 1928), page 5, Andres Abel will abstract; digital images, Ancestry.com (http://www.ancestry.com). 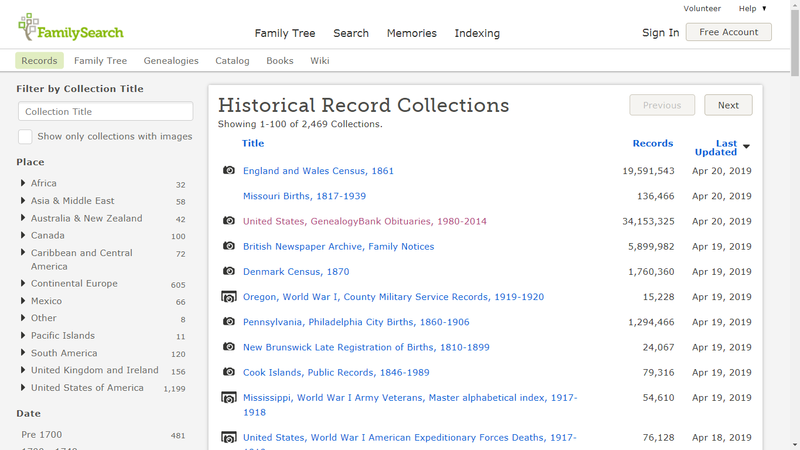 NOTE: In 2014, Amy Johnson Crow suggested a weekly blog theme of "52 Ancestors" in her blog post 52 Ancestors in 52 Weeks on the No Story Too Small blog. I have extended this theme in 2019 to 312 Ancestors in 312 Weeks.